KSRealityBites: Teens who drink 100% fruit juice 've healthier diets! Teens who drink 100% fruit juice 've healthier diets! A recent study published in the Journal of Health Promotion has shown that 100% fruit juice consumption promotes nutritious diet in teens when compares to the non consumers. There are no association between 100% fruit juice consumption & weight. 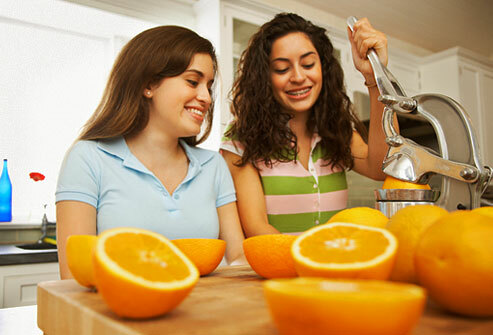 Teenagers who consumed more than 6 ounces of 100% juice a day consumed more nutritious foods. They consumed whole fruits & lesser fats & sugars. As a result, the teens had a healthier diet which was low on saturated fats but high on essential nutrients such as Vitamins C & B6, folate, potassium & iron. Drinking 100% fruit juice is not related to weight gain. Drinking 100% fruit juice did not affect milk consumption. The above result would mean that 100% fruit juice consumption in teens were less prone to obesity & its related disorders & has better insulin sensitivity. The data for above studies was taken from the National Health & Nutrition Examination Survey, 1999-2002. The National Health & Nutrition Examination Survey (NHANES) is a program of studies designed to assess the health & nutritional status of adults & children in the United States. The survey is unique in that it combines interviews & physical examinations. The studies thus prove that 100% fruit juice is a smart choice. Dr Theresa Nicklas, of the Children's Nutrition Research Center at Baylor College of Medicine & the lead researcher in the study, said: “It provides important nutrients that growing teens need & the research consistently shows that drinking fruit juice is not linked to being overweight". The studies reiterate the similar findings in a research published in the prestigious Archives of Pediatric & Adolescent Medicine in 2008.The studies showed that 100% juice consumption among children ages 2 to 11 years old was also associated with a more nutritious diet & similarly, was not linked to overweight. Overall, drinking fruit juice offers not only a good taste experience but also promotes good health. Not only this, 100% juices are also free from fat, contain a variety of nutrients which are found naturally in fruits & rich in vitamins, minerals which are essential for general well being.